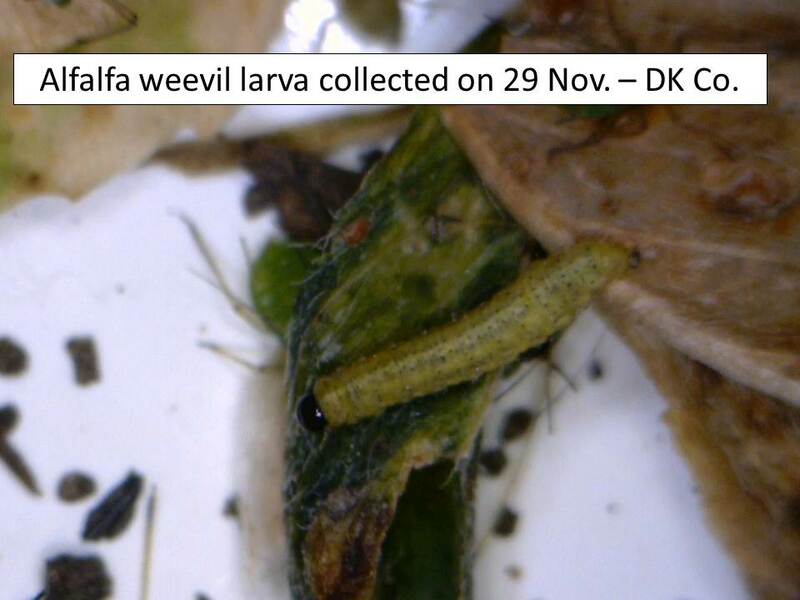 Thanks to the unusually warm winter, alfalfa weevil larvae are already present in some areas. Many more will no doubt be hatching in the next few days to weeks. Alfalfa weevils will continue to hatch and larvae continue to develop any time temperatures exceed 48°F. Thus, it looks like larvae will be emerging, and damage progressing, relatively quickly. Whether this warm weather will compress the alfalfa weevil larval feeding so that the period of damage is not as stretched out as usual remains to be seen. There are also lady beetles active in the alfalfa fields, as well as a few pea aphids. The treatment threshold we use for alfalfa weevil insecticide applications is 30-50% infestation, i.e. 1 larva/2-3 stems. Alfalfa weevils are cool-weather insects. Adults lay eggs in alfalfa fields in the fall or even the winter. Most of these eggs survive the winter. 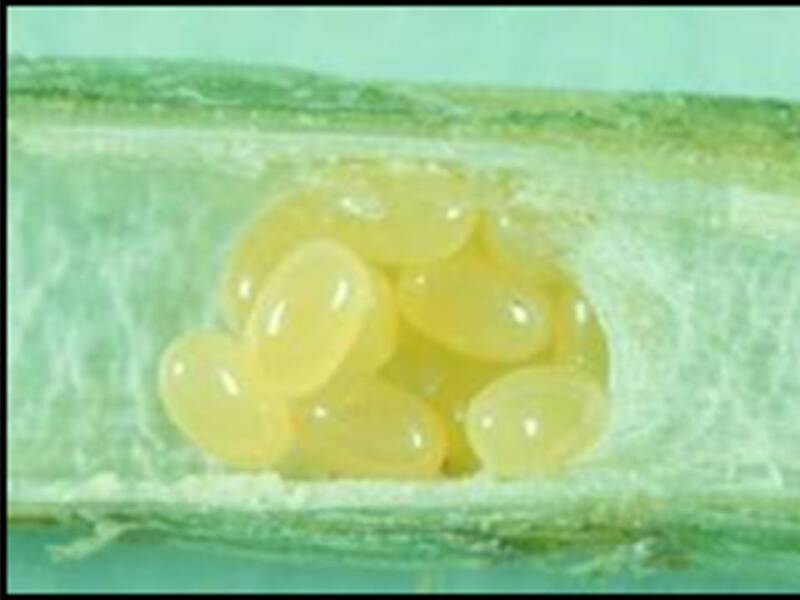 Eggs hatch and larvae emerge after accumulating enough degree days or thermal units, normally in early spring. Alfalfa weevil adults also lay eggs in the spring, but in many cases the first larvae to emerge are from eggs that were laid in the fall and overwintered. That said, an anomaly we encountered in the fall of 2016 was a significant infestation of relatively large (2nd and 3rd instar) larvae from mid-November to mid-December. Alfalfa weevils normally overwinter as eggs or adults – not larvae. In the last week we could find none of these more mature larvae, or any pupae. So, hopefully they perished in the colder weather. Figure 1. 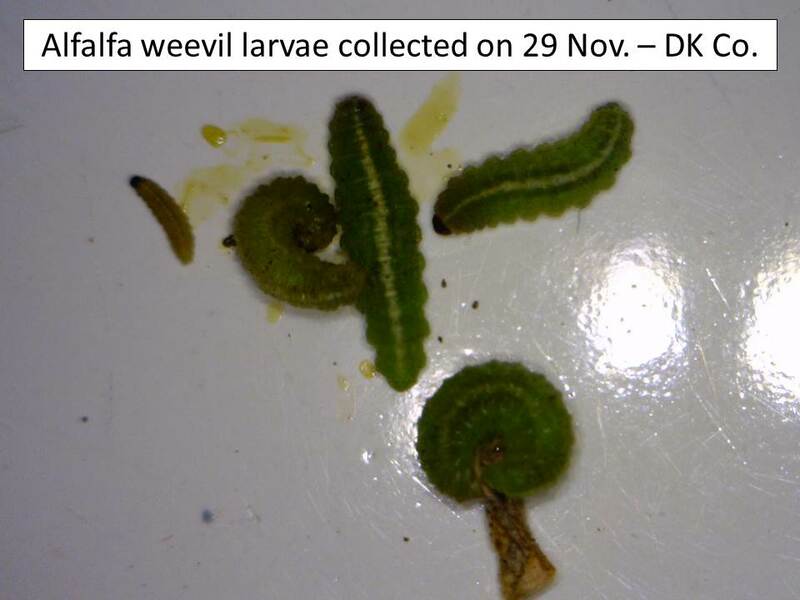 Alfalfa weevil larvae collected Nov. 16, 2016 in Dickinson Co. Figure 2. 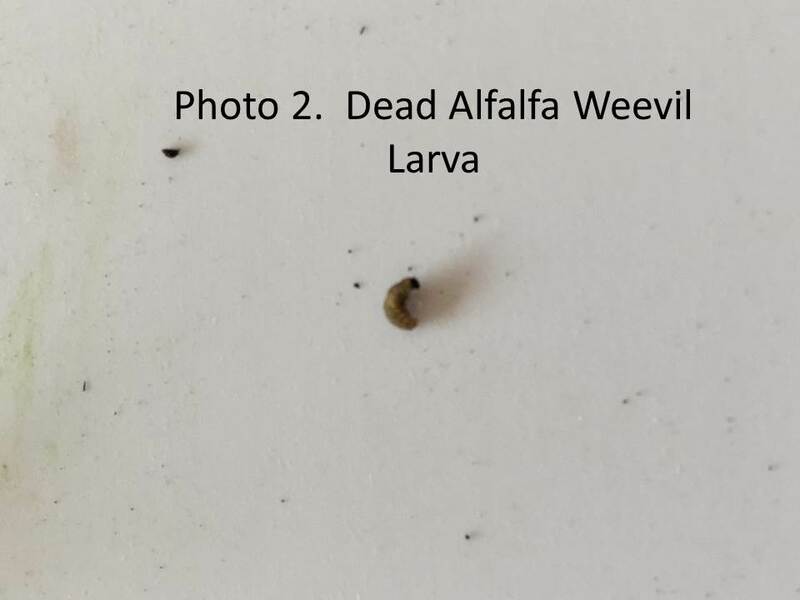 Alfalfa weevil larva collected Feb. 22, 2017 in Dickinson Co. Scouting for alfalfa weevil larvae should start after plants break dormancy – which means now. A degree day or thermal unit accumulation system can be used to predict when to initiate scouting. Insect development is controlled by temperature. This can be used to help manage these pests. Weevil activity has been tracked in Kansas for the past few years and has been used to generate recom­mendations (Table 1). To calculate a degree day, record the daily high tempera­ture anytime it exceeds 48ºF. For example, if there is only one day in January that the temperature exceeded 48ºF, take that temperature and add the lowest temperature for that day, or 48ºF, whichever is higher. Then divide by 2 to calculate the average tempera­ture for that day. Next, subtract 48ºF. 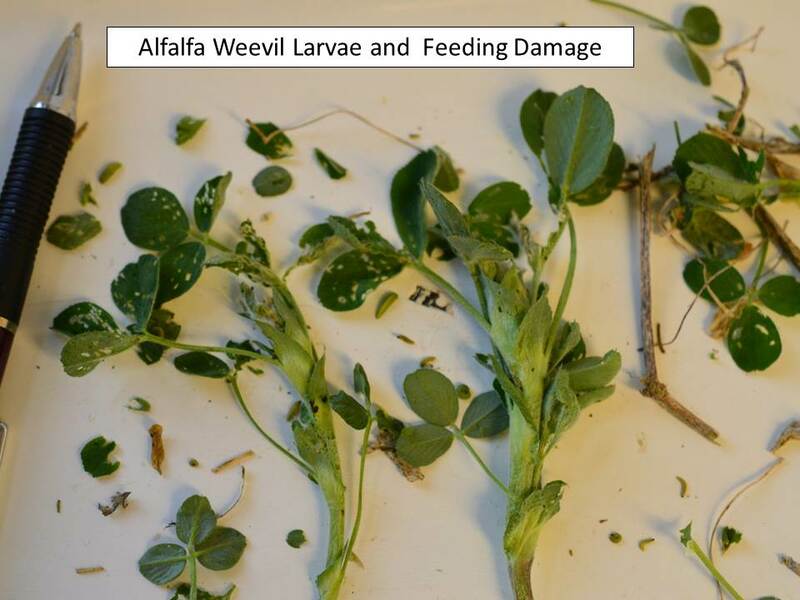 Do not be too quick to treat for alfalfa weevil. Wait until the field reaches the treatment threshold. Treating too early is not only unnecessary, it can also have detrimental effects by killing beneficial insects. 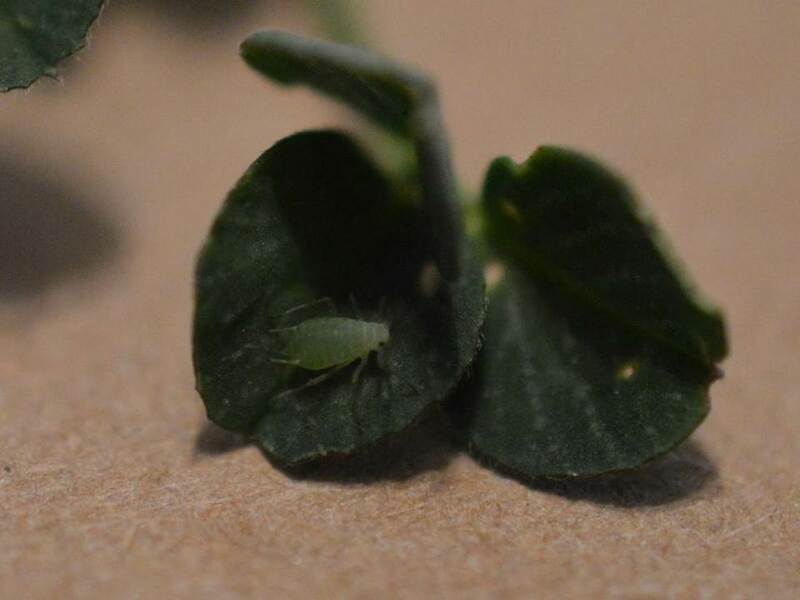 While scouting for alfalfa weevils, you will probably also notice a few pea aphids. These are also early season potential pests. However, in the past few years pea aphids have seemed to be adequately controlled by adult lady beetles. This year seems to be starting that way as well, with a few pea aphids, but also many adult lady beetles present. Figure 3. Pea aphid on alfalfa leaf. Also, producers need to keep an eye out for army cutworms as there were some reports of army cutworm activity last fall. Army cutworms start feeding again any time temperatures are above 50 degrees F. Armyworms are another potential problem, but probably a little later in the spring. 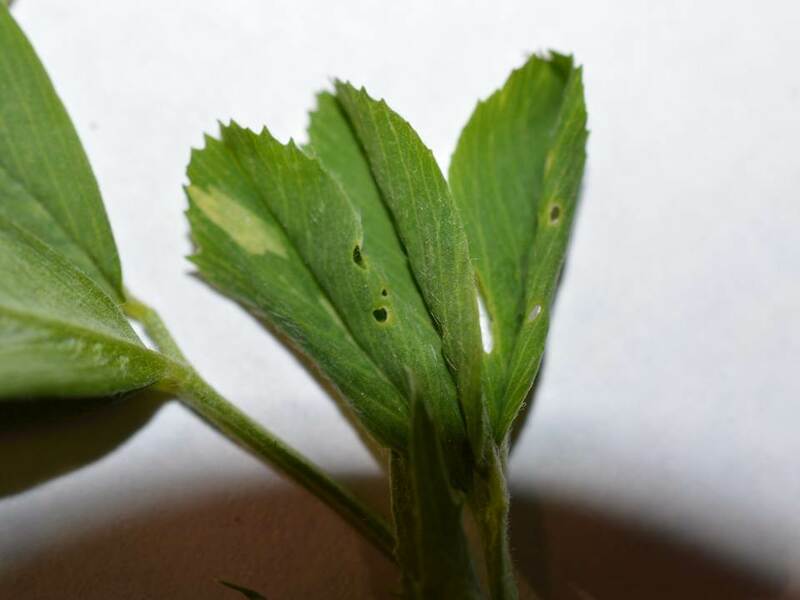 Alfalfa pests are still causing concern among alfalfa producers. 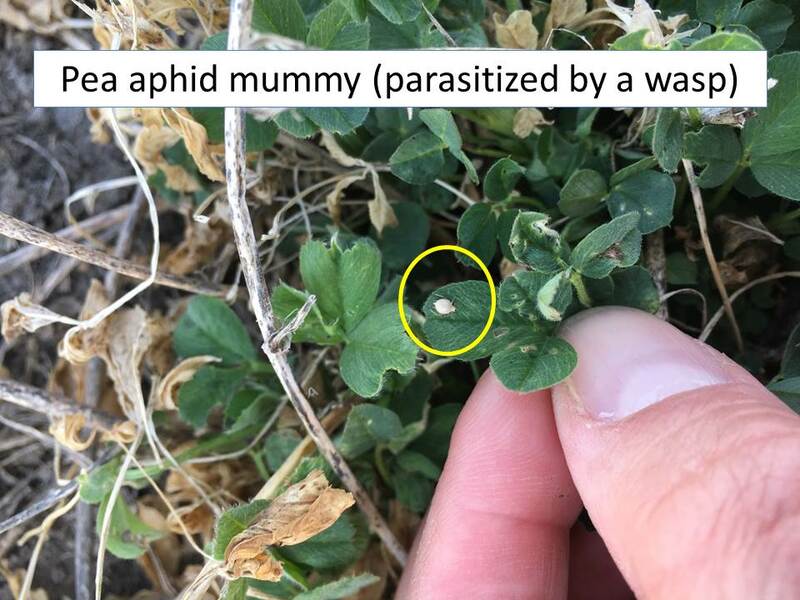 In north central Kansas the alfalfa has yet to become dormant, at least as of 29 Nov. Also, in these slowly growing fields the pea aphids seem to be doing very well and no beneficials, which might help to control them, were detected. Also, alfalfa weevil larvae are still actively feeding on leaf tissue. One potato leafhopper was also picked up in sweep net samples. 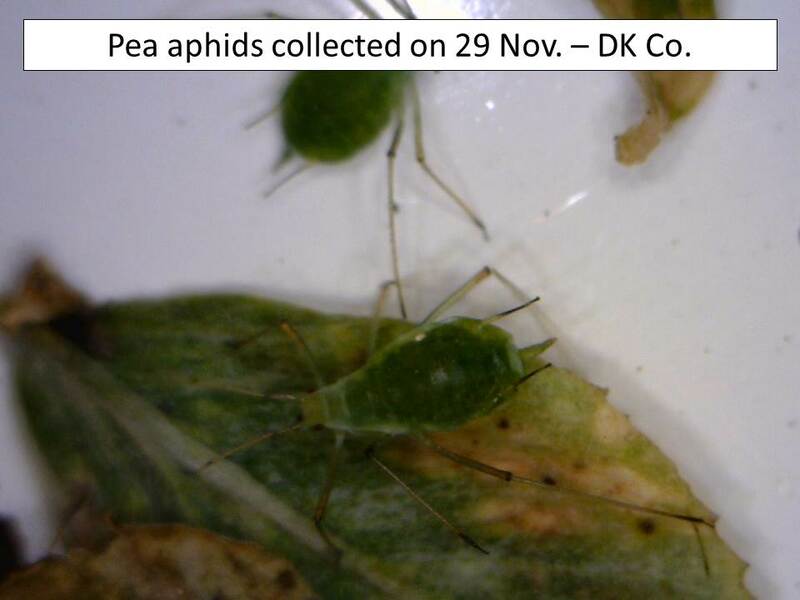 Hopefully, the colder winter weather will eliminate the pea aphids and alfalfa weevil larvae! Alfalfa continues to be problematic in NC Kansas. There seems to be many fields of good alfalfa, apparently treated in an effective manner from both an insecticide and a timing standpoint, and not affected by the freezing temperatures earlier this spring. Many of these fields have been, or are being, swathed. 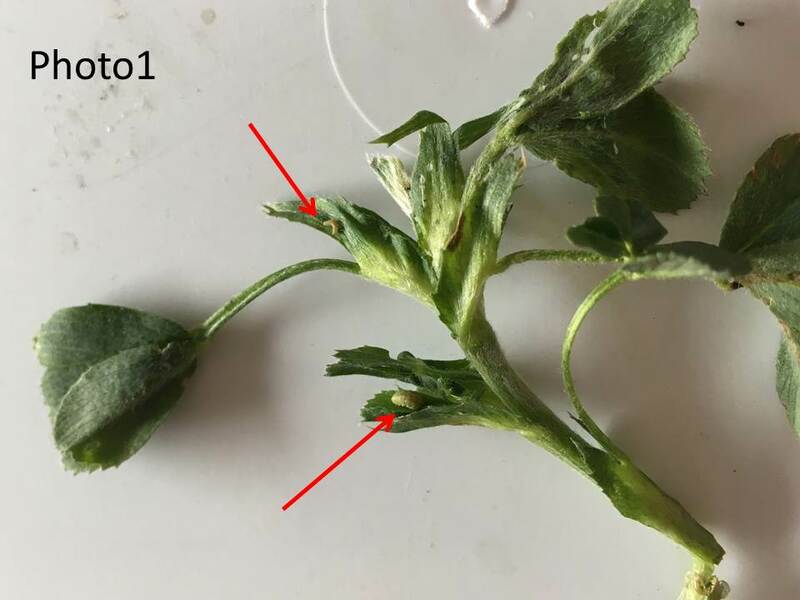 However, there are some fields that have had, or are having, a difficult time overcoming the combination of alfalfa weevil larval feeding, early season dry conditions, and the early spring freezing temperatures. In all fields, the early season warmth sped up alfalfa weevil development and feeding, then the cooler temperatures slowed it back down. 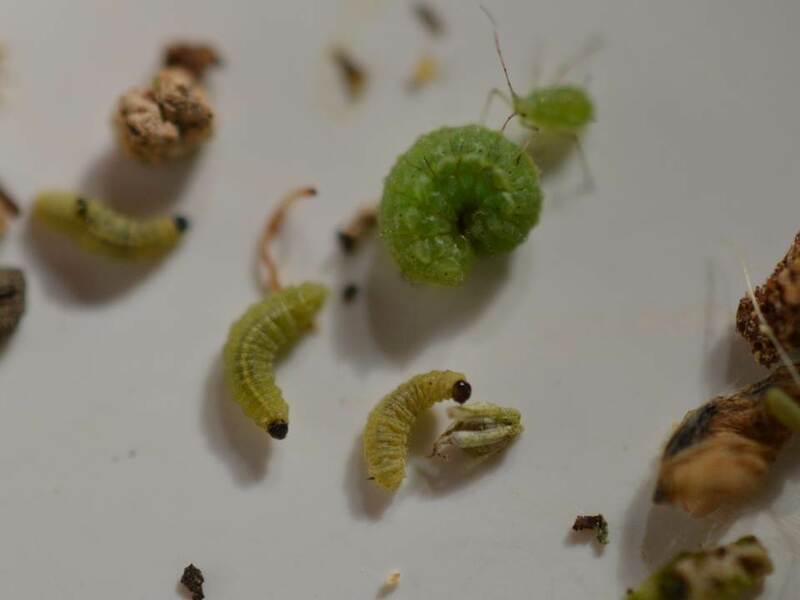 Alfalfa weevil larvae were 1st detected in NC Kansas in early March. 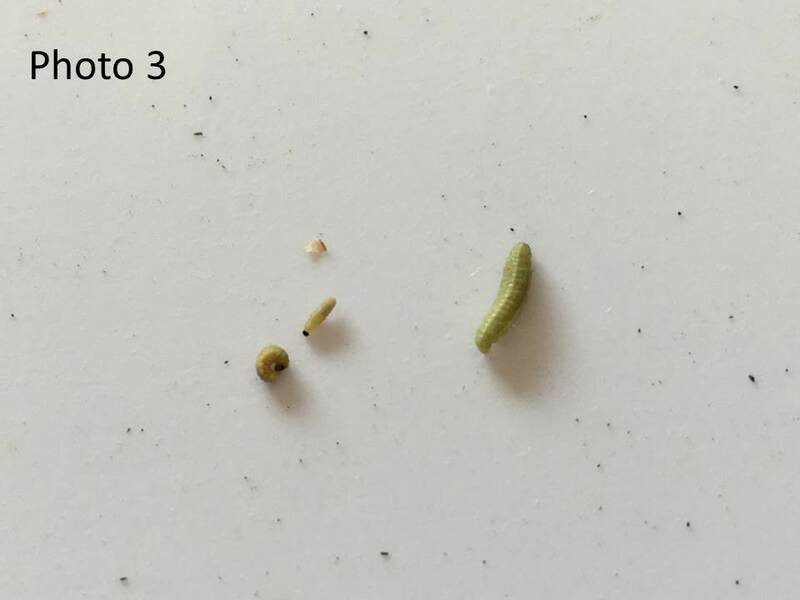 Small, 1st instar larvae are still being detected in some fields. 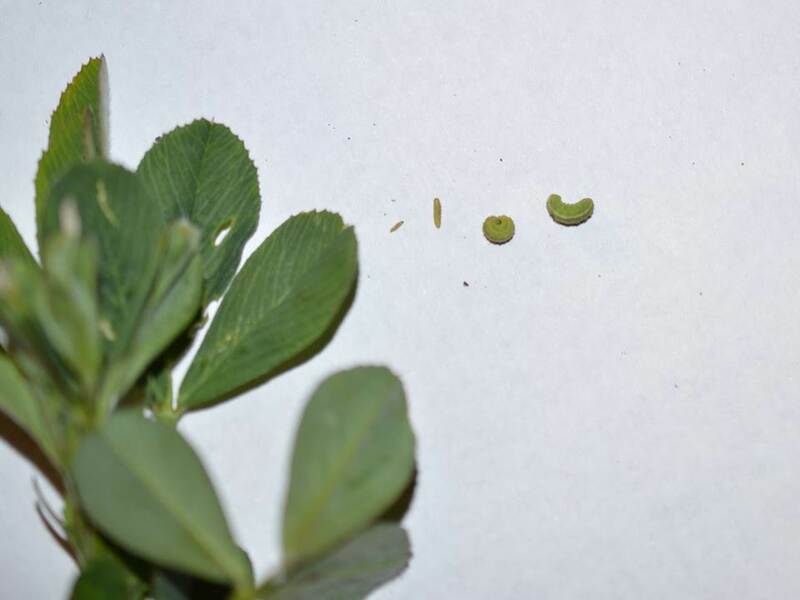 Some larvae pupated and developed into adults as long as three weeks ago, and they are still in the alfalfa fields. So, NC Kansas still has a significant number of adults. 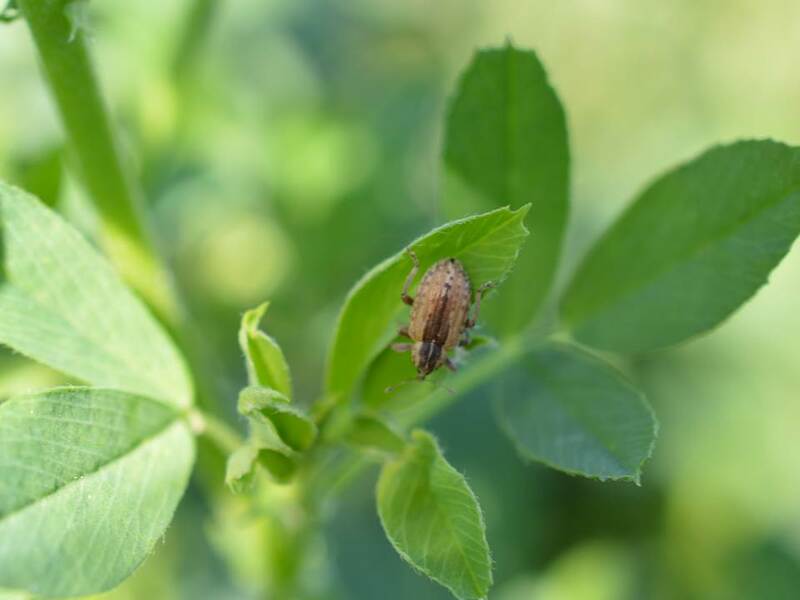 Treating for adult alfalfa weevils is rarely effective, but swathing within 7-10 days should help manage both larvae and adults without an insecticide application. 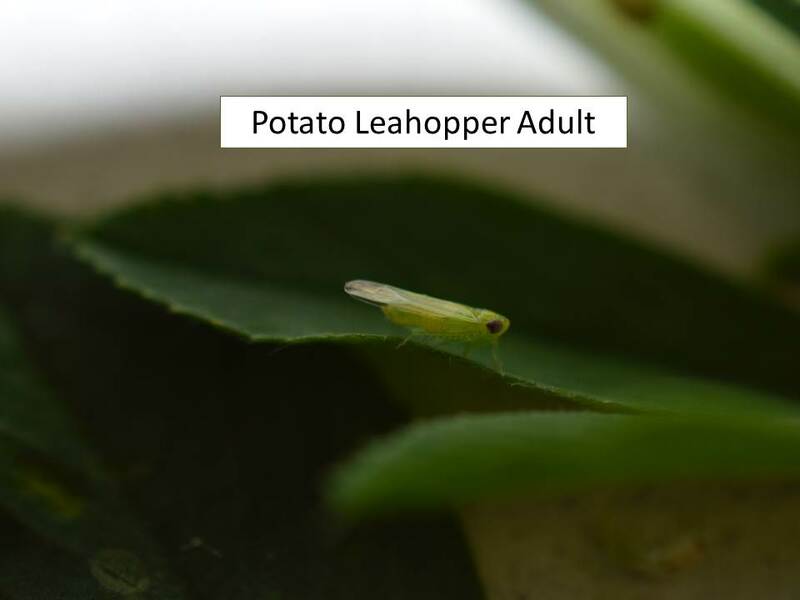 Adult potato leafhoppers have also been noted in alfalfa fields. These usually migrate into Kansas between the 2nd and 3rd cuttings, so they are about a month early this year. 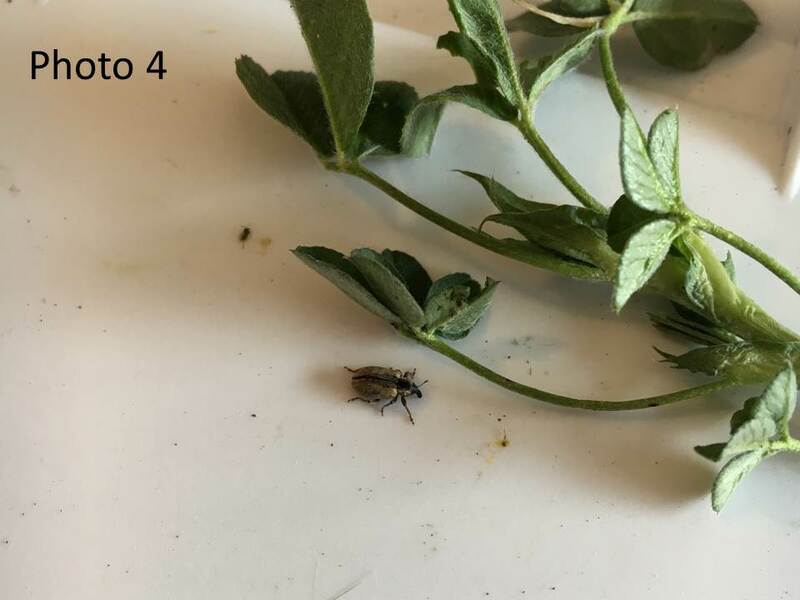 Alfalfa weevils continue to be very active throughout north central Kansas, and the Kansas spring weather continues its usual erratic conditions. However, the alfalfa weevil larvae continue to feed voraciously. They have been slowed a little by the cooler weather but, remember, they do continue to feed 24/7, any time the temperatures are at least 48°F. Much like the last few years, 2016 seems to be a good year for alfalfa weevils with most fields having multiple larvae/stem, at various developmental stages. 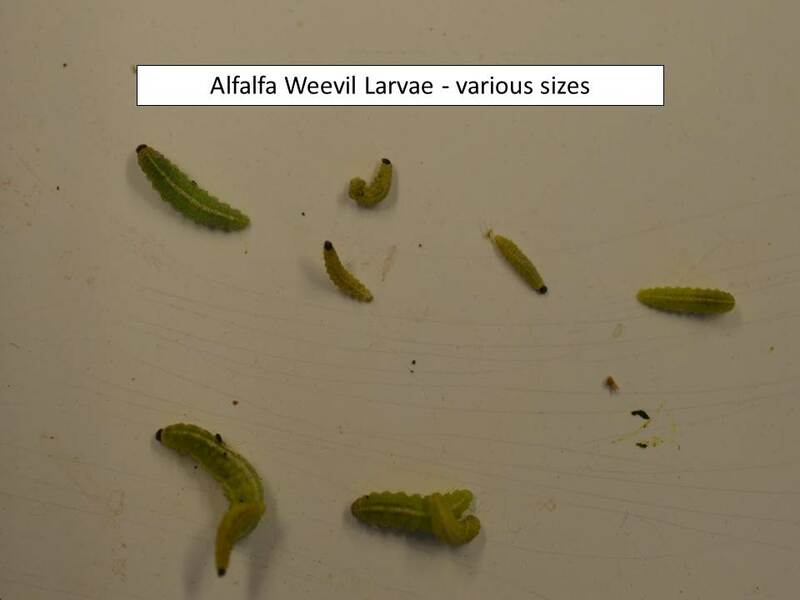 Alfalfa weevil larvae were first detected in north central Kansas on 3 March. 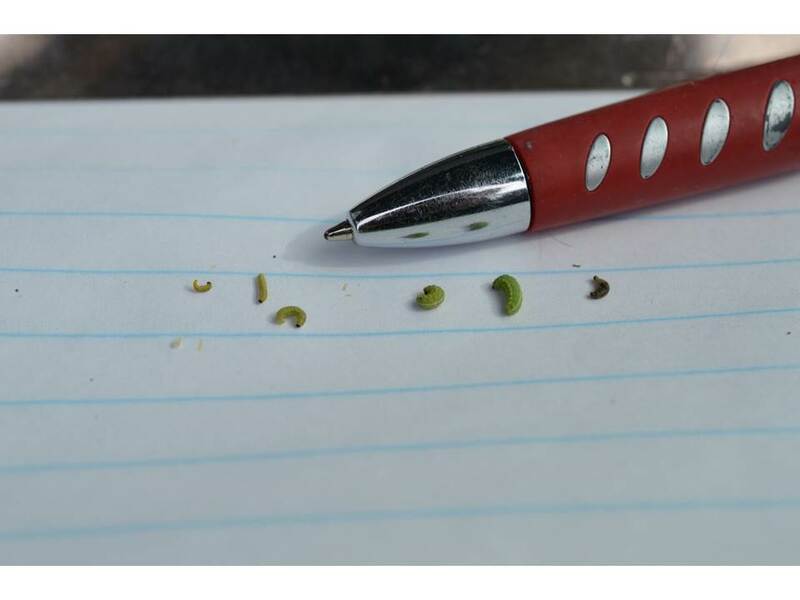 Mr. Chuck Otte, Ag and Natural Resources Agent, also reported finding small larvae on 5 March in Geary County and Mr. Tom Maxwell, Ag and Natural Resources Agent, also reported finding small larvae and pinprick-sized holes in new alfalfa leaves on 9 March in Saline County. So, ready or not, alfalfa weevil larvae are here and, I would bet, many more will be hatching in the next few days to weeks. 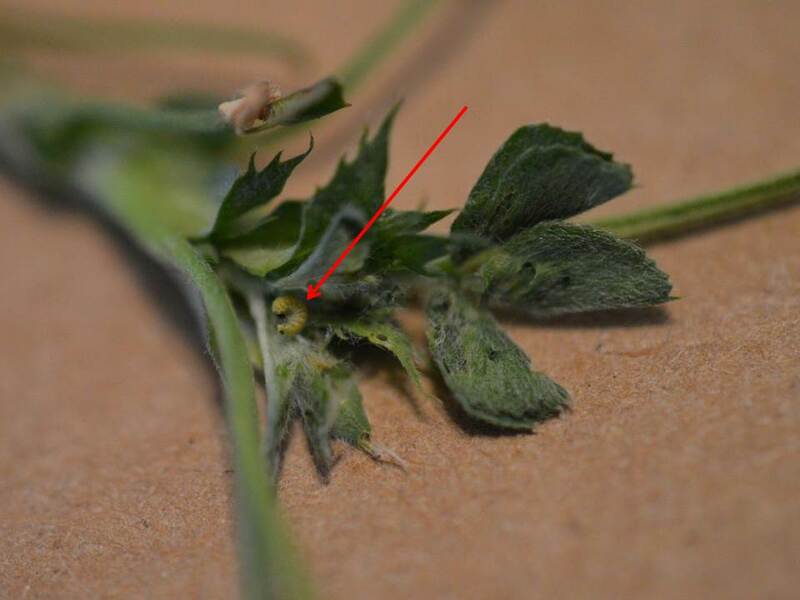 Alfalfa weevils will continue to hatch and larvae continue to develop any time temperatures exceed 48°F – and those temperatures have been much more common over the last few weeks than usual. Forecasts for the next 7-10 days also look for warm conditions. Thus, it looks like larvae will be emerging, and damage progressing, relatively quickly. Whether this warm weather will compress the alfalfa weevil larval feeding so that the damage is not as stretched out as usual remains to be seen. There are also many lady beetles present in the alfalfa fields we have checked as well as a few pea aphids. Treatment thresholds we use for alfalfa weevil insecticide applications are 30-50% infestation, i.e. 1 larva/2-3 stems.